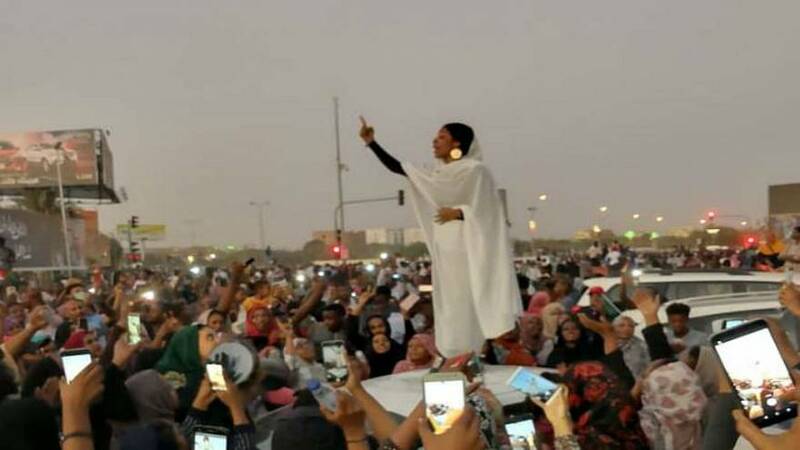 A photo of a young Sudanese woman addressing a crowd of protesters in Khartoum has gone viral across the world, becoming an icon of the uprising against the country's ruler President Omar al-Bashir, as well as a symbol of female leadership. The female protester, in her 20s and studying architecture, was seen standing on a car and speaking with one arm raised up high. The picture was taken on Monday night in the centre of Khartoum, as tens of thousands thronged the roads in front of the heavily guarded complex housing the headquarters of the military and the feared intelligence services. The image has since received more than 53,000 likes and was picked up by Twitter Moments. The young woman, alone, standing above the crowd is chanting "My grandmother is a Kandaka!" as the crowd responds with "Revolution!" "Kandaka" is the title given to the Nubian queens of ancient Sudan and has now become a popular nickname for women protesters. The term evokes a legacy of empowered women who fight hard for their country and their rights. There is indeed a long tradition of women leading unrest in Sudan. Hind Makki, an interfaith academic, said on Twitter the young women's outfit was a "callback to the clothing worn by our mothers & grandmothers in the 60s, 70s, & 80s who dressed like this during while they marched the streets demonstrating against previous military dictatorships,"
She added the white robe and gold moon earrings represented "working women" and "feminine beauty". Women have been at the forefront of the demonstrations in Sudan in recent months, with men often a minority among the crowds calling for president Omar al-Bashir to step down. Women's rights activists say the lives of Sudanese women have changed fundamentally in recent decades, with restrictive laws dictating what they can wear and where they can go. Since December last year, Sudan has been rocked by persistent protests sparked by the government's attempt to raise the price of bread, and by fuel and cash shortages. The demonstrations have developed into the most sustained challenge to Bashir's rule since he took power three decades ago. Bashir, who is being sought by international prosecutors for alleged war crimes in the country's western Darfur region, has refused to step down and said his opponents need to seek power through the ballot box.